Lead Certified | Genesis Painting, Inc.
As of April 22, 2010, companies working in homes built before 1978 will need to be certified “lead-free certified.” How is that important to you? Genesis Painting was one of the first LEAD safe companies in Dane county. We have fifteen lead safe certified trained job supervisors and all other employees have received the proper training under the EPA and State of WI laws. You won’t be taking any risks with your property or family when hiring Genesis. Don’t take a chance and hire a non certified company. In the first year that the Rule is in effect, EPA estimates that approximately 8.4 million renovation, repair and painting projects will trigger the regulation’s requirements. There are enforcement provisions within the Rule that enable EPA to issue civil penalties of $32,500 for failure to comply and criminal penalties of $32,500, plus potential jail time, for willful and wanton misconduct. The EPA can impose fines, shut down projects if contractors are not certified or disobeying rules. 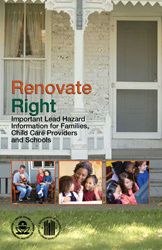 Before work starts the company has to distribute to the home or building owner the EPA booklet “Renovate Right: Important Lead Hazard Information for Families, Child Care Providers and Schools.” A confirmation of receipt of the lead pamphlet (pg. 14) must be signed by the owner, operator or occupant. Once work starts on a pre-1978 renovation, the Lead Safe Renovator has a number of responsibilities. Before the work starts this person will post warning signs outside the work area and supervise setting up containment to prevent spreading dust. The rule lists specific containment procedures for both interior and exterior projects. Lead hurts kids and we want to prevent exposure before it happens. Since 1996 more than 46,000 children in Wisconsin have been identified with lead poisoning. In 2008, the number was more than 1,600 children–an average of 4 children identified with lead poisoning per day. That is unacceptable!